Secret Agent Avia Jiutai has begun reporting false memories. The agent's entire life history is on file with very few inconsistencies or omissions, as is tradition with agents of the SIU. However, Jiutai reports that after several nights of insomnia, memories of a life not matching his record have surfaced. Reported memories began as detailed thoughts about trips and vacations the agent never went on and several details of a childhood friend that Agent Jiutai has no record of having ever known. The invasive memories reportedly began introducing a long marriage that never supposedly happened. The agent was taken in for a sleep study to determine if unusual mental activity during dreams was creating false memories. After an unusually long period of sleep, the agent woke up in deep confusion and distress; after being calmed and fed, the agent reports memories of an entire second, fictional life - vivid and realistic memories of a separate childhood, career, and marriage, apparently unsure of which history was correct. Agent Jiutai has been put on leave to re-familiarize themselves with our in-house records and is undergoing psychological evaluation. Secret Agent Gedat Rakkin has returned from investigation into an Australian cryptid (with no success) and seems to have acquired a heavy native Australian accent. Accent mimicry is not unheard of for travelers, though it is rare for well trained agents, but Rakkin's seems particularly authentic and the agent seems unable to revert back to his normal speech. Most unusually, however, is that this particular accent seems contagious as the three debriefing agents found themselves with a similar accent after the agent's interview. As of this week, the Australian speech has been noted to be slowly spreading across the SIU main headquarters with converted speakers unable to stop. Psychological evaluations have begun and infected agents are being placed into quarantine as a safeguard against potential viruses or psychic attacks. Senior Agent Wheaton Adams has returned from an investigation into an American apple orchard. "Ghost apples", the phenomenon in which frost forms around an apple and leaves the empty, icy shell of an apple after the fruit has rotted and fallen, is a benign sighting of minor interest in farms where winters get cold. According to photos and personal reports by Agent Adams, however, this farm had a much more sinister shape appear beneath some of their trees: ice in the hollow form of slumped, anthropoid bodies. At least seven adult-sized forms were found around the farm, their heads all appearing to terminate at stems and branches where apples would typically be found growing. No corpses were reported found, neither were footprints around the site or fingerprints on the trees or ice. Though a presumed hoax, no culprit or immediate method of creation has been discovered; the farm has been placed under close watch. The search for Wes Andrews, wildlife researcher who was reported missing in Central America, continues with Special Agent Chaz Gates now on the scene. Agent Gates followed reported sightings of the scientist in a small rural village, where the scientist's distinct scale pattern was mentioned in reports of livestock mutilation. An exhaustive, yet covert, investigation through local jungle began, and Gates eventually found a colony of especially large spiders. The largest of which (its full leg span was estimated to be almost five feet) was said to have featured the distinct orange and black markings that characterized the missing scientist's scales. An extraction team has been dispatched in hopes of capturing this specimen, and it is yet to be determined if the colors of its carapace indicate a transformation of the researcher, a theft of genetic code, or mere coincidence. Special Agent Arukino has been put under special investigation for what appears to be too mundane of a report. 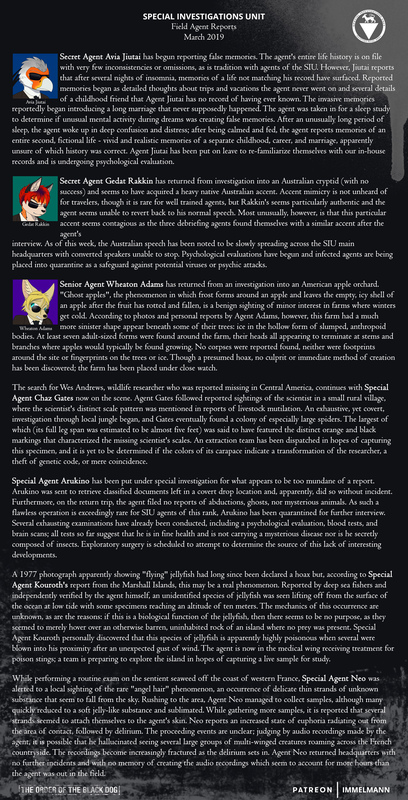 Arukino was sent to retrieve classified documents left in a covert drop location and, apparently, did so without incident. Furthermore, on the return trip, the agent filed no reports of abductions, ghosts, nor mysterious animals. As such a flawless operation is exceedingly rare for SIU agents of this rank, Arukino has been quarantined for further interview. Several exhausting examinations have already been conducted, including a psychological evaluation, blood tests, and brain scans; all tests so far suggest that he is in fine health and is not carrying a mysterious disease nor is he secretly composed of insects. Exploratory surgery is scheduled to attempt to determine the source of this lack of interesting developments. A 1977 photograph apparently showing "flying" jellyfish had long since been declared a hoax but, according to Special Agent Kouroth's report from the Marshall Islands, this may be a real phenomenon. Reported by deep sea fishers and independently verified by the agent himself, an unidentified species of jellyfish was seen lifting off from the surface of the ocean at low tide with some specimens reaching an altitude of ten meters. The mechanics of this occurrence are unknown, as are the reasons: if this is a biological function of the jellyfish, then there seems to be no purpose, as they seemed to merely hover over an otherwise barren, uninhabited rock of an island where no prey was present. Special Agent Kouroth personally discovered that this species of jellyfish is apparently highly poisonous when several were blown into his proximity after an unexpected gust of wind. The agent is now in the medical wing receiving treatment for poison stings; a team is preparing to explore the island in hopes of capturing a live sample for study. While performing a routine exam on the sentient seaweed off the coast of western France, Special Agent Neo was alerted to a local sighting of the rare "angel hair" phenomenon, an occurrence of delicate thin strands of unknown substance that seem to fall from the sky. Rushing to the area, Agent Neo managed to collect samples, although many quickly reduced to a soft jelly-like substance and sublimated. While gathering more samples, it is reported that several strands seemed to attach themselves to the agent's skin. Neo reports an increased state of euphoria radiating out from the area of contact, followed by delirium. The proceeding events are unclear; judging by audio recordings made by the agent, it is possible that he hallucinated seeing several large groups of multi-winged creatures roaming across the French countryside. The recordings become increasingly fractured as the delirium sets in. Agent Neo returned headquarters with no further incidents and with no memory of creating the audio recordings which seem to account for more hours than the agent was out in the field.